Have you tried Swagbucks? Earn Free swagbucks just for searching the web and turn them into amazon gift cards, paypal cash, and more! Sign up now and get 30 FREE swagbucks!! 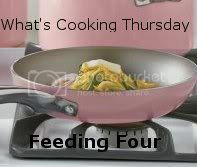 Welcome to What's Cooking Thursday! A place for you to link up whatever it is you've been cooking at your house! Not a blogger? Leave your recipe in the comment section. Look for a featured recipe next week. Feel free to link up as many recipes as you'd like, all I ask is that you link back to What's Cooking Thursday! I've been working on recipes that will get the most out of my ingredients. And I want to use up what I have. The other night, I had some leftover veggies and some leftover turkey. Plus I have a gazillion cream of soups. 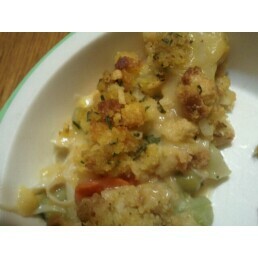 I added in some stuffing and had a wonderful filling meal for dinner. Prepare stuffing as directed on package. Meanwhile, combine other ingredients in a casserole dish. Spread prepared stuffing overtop. Bake at 400 degrees for 30 minutes. Serve! 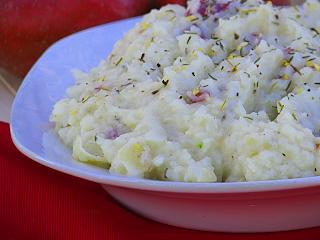 Your dish looks like it'd be great for Thanksgiving leftovers! Thank you so much for hosting. 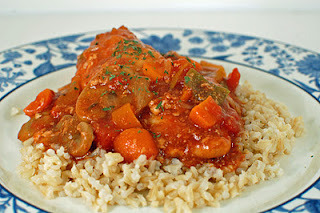 That Garden chicken Cacciatore looks so delicious. Today I am sharing my Kickin' Chicken Parmesan and also some yummy Cherry Walnut Oatmeal bars. I am feeding my family of picky eaters on $25 a week. Check back often for meal plans, recipes, grocery trips, and more.